Annual MIP (charged monthly) —Called an annual premium, this is actually a monthly charge that will be figured into your mortgage payment. It is based on a borrower’s loan-to-value (LTV) ratio, loan size, and length of loan. 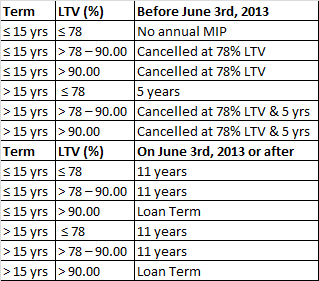 There are different Annual MIP values for loans with a term greater than 15 years and loans with a term of less than or equal to 15 years.Loans with a term of greater than 15 Years and Loan amount < or =$625,000. Minimum credit score of 500-579 for maximum LTV of 90 percent with a minimum down payment of 10 percent. FHA-qualified lenders will use a case-by-case basis to determine an applicants’ credit worthiness. Typically you must be two years out of bankruptcy and have re-established good credit. Exceptions can be made if you are out of bankruptcy for more than one year if there were extenuating circumstances beyond your control that caused the bankruptcy and you’ve managed your money in a responsible manner. See this page for more details. Typically you must be three year out of foreclosure and have re-established good credit. Exceptions can be made if there were extenuating circumstances and you’ve improved your credit. If you were unable to sell your home because you had to move to a new area, this does not qualify as an exception to the three-year foreclosure guideline. There are maximum mortgage limits for FHA loans that vary by state and county. In certain counties, you may be able to get financing for a loan size up to $729,750 with a 3.5 percent down payment. Conventional financing for loans that can be bought by Fannie Mae or Freddie Mac are currently at $625,000. You can shop for mortgage quotes for an FHA loan on our website. Apply now.